Not too long ago, somebody repeated an interesting saying to me. I doubt it was an original thought; rather, it has been repeated over and over again and probably attributed to 20 different people. So I won’t try to correctly attribute the original author, but the meaning is excellent just the same. I have been reminded of this indisputable fact over and over recently. Writing this very column is one example, as the staff of The Tennessee Magazine was kind to patiently await my submission as it was submitted dangerously close to the print deadline. If you’ve never had a regular deadline for a work product, the clock does start to tick a little bit louder and a lot faster the closer you get to “zero hour.” My pastor friends say that is especially true for Sunday mornings. Unfortunately, I usually need to hear that clock ticking louder and faster before I get serious about finishing my work. But we all face pressures of some kind to complete a task because, for the most part, life does operate on a schedule. Each and every day the mailman has to finish his rounds. Mom or dad have to prepare meals for the kids. The store must open and close its doors. Many of our pleasures and hobbies even come with a time limit. So it’s natural for us to push back and try to escape the pressures of time. Perhaps that is why I am a baseball fan, as it is the only major team sport that does not utilize a clock. But, I don’t think efficiently managing our time and meeting deadlines are what the saying intends to communicate. It’s not a question of how we spend our time — it’s urging us to ponder why we spend our time. Why do we choose to spend the limited amount of time we have on this Earth doing the things we do? What is the purpose of that time, and is it truly worth it? I have four young sons, so I have been feeling especially convicted by this question lately. For example, our twins just had their very first baseball practice. As I watched them on the field listening to their coach and running around the bases, my mind started to wander. What items were left undone at the office this week? What will happen next month in the Congress? When should I get that ding in the truck fixed? And then, as I was needlessly worrying about things that could wait, I almost missed it. The boys fielded a grounder and threw it to first base. And they both looked straight at me with a look of pride, excitement and happiness that I hope I’ll never forget. Thankfully, I was watching at that moment and gave them a big thumbs up. It was a brief few seconds, yes, and their accomplishment wasn’t something that will be written about in the history books. But what if I had still been thinking about work or reading email on my phone? That moment in time would never have repeated itself, and I probably would never have known that it even occurred. There are a lot of choices we make in life that we can correct if we get it wrong. Not so with the way we spend our time. So my question is this: What moments have you missed? And was whatever you were doing worth it? But his passion in life is the organization he created: the Folds of Honor Foundation, built to provide college scholarships for the survivors of those heroes who have been killed or disabled in service to our country. You see, in the middle of marking off the many tremendous personal accomplishments in his own life, Rooney realized that his time and efforts had a greater purpose. He realized his life could have an impact. He realized that it wasn’t all about him. Attitude is a choice, and we all have been given the gift to decide how we will conduct ourselves. As we start a new year, I challenge you to make an impact. It doesn’t have to be as dramatic and large as Maj. Rooney, but you can make a difference in your community. All it takes is a decision on your part to do it. Our weekend shopping excursion had several oddly related purchases. Among them: butter, dog food, cranberry juice and running gear. All interconnected to each other. And all have something uniquely in common with your electric bill. The link? For the first clue, we go to England. The year is 1844, and 28 weavers have just formed the Rochdale Society of Equitable Pioneers. This group of tradesmen was able to collectively sell their products in a store that they could not have individually afforded. Yet working together, they prospered, eventually expanding into ownership of a mill and textile factory. The “Rochdale” principles they adopted eventually evolved into today’s Seven Cooperative Principles. Your electric cooperative still operates by them. And 2012 has been named the International Year of the Cooperative. Residents of rural and suburban Tennessee are most likely members of an electric or telephone cooperative — often both. 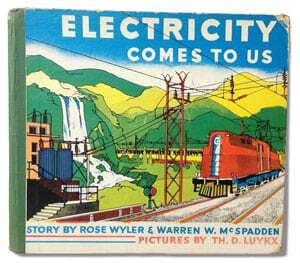 Occasionally derided as anachronistic relics of the Depression Era, electric cooperatives are anything but irrelevant. Nationwide, we’re leaders in energy-efficiency efforts, advanced metering infrastructure and alternative energy solutions. Member-owned and member-governed, we are nonprofits, operating as economically as possible and reinvesting margins back into the cooperative and the community. “At a time when folks are losing faith in big corporations, the International Year of Cooperatives offers us a great opportunity to showcase many ways the local, consumer-owned and member-controlled cooperative form of business benefits communities all over the world,” declares Glenn English, CEO of the National Rural Electric Cooperative Association. The number of cooperatives is staggering: There are 900 electric cooperatives and 260 telephone cooperatives in the U.S., serving 42 million electric co-op members and 1.2 million rural telephone members. All told, the United States boasts 29,200 co-ops that run the gamut from insurance companies, food processors, daycare centers and apartment complexes to the better-known farmers co-ops. Other familiar names you might not recognize as cooperatives are Ace Hardware, Blue Diamond Almonds, Welch’s, Nationwide Insurance, Sunkist, the Associated Press and Dairy Farmers of America. All are based on the same principle-driven model that forms the foundation for electric cooperatives. So what co-op stops were on our shopping trip? The butter was made by Land O’ Lakes, the dog food came from Sumner Farmers Co-op, Ocean Spray made the cranberry juice and the running gear came from Recreational Equipment Inc. — better known as REI. For more information about the Rochdale cooperative, Benjamin Franklin’s cooperative effort and an international perspective, go to tnelectric.org.